My best friend and her husband are directors for Convoy of Hope Haiti. My friend was here in Springfield on Tuesday, Jan. 12th. Her husband was in Haiti hanging on to a balcony railing, riding out the quake. He was there on a routine trip....one of several this year. Can you imagine being that far away from your husband, knowing an earthquake just ripped through the city where he was? They are both so strong..... I admire them a lot. I've been so moved by all of stories coming out of Haiti. 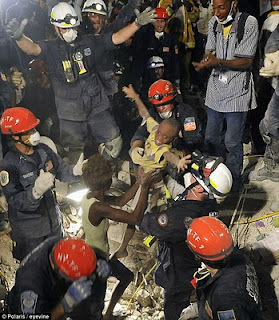 Stories of survival.....three month olds pulled out of the rubble, alive and well, after being buried for days. ( And to think there are people who don't believe in miracles...???) Stories of lives being saved on US military ships and the injured being flown to medical facilities to be cared for by generous surgeons and doctors. Stories that tell of the unmistakeable tenacity of the human spirit. Stories of sweet Haitian children giving an enthusiastic "Thank you!" for one single bottle of water that they had to wait in line for hours to even get. It's all been so overwhelming and inspiring at the same time. For me personally, in my everyday life, these stories just cause my perspective to change. If you know me at all, you know I dread the weekly trip the grocery store. It's just seems so tedious and time-consuming. This week I heard myself almost saying out loud, "Really Kristi, you're gonna gripe about a tedious trip to the grocery? You hardly know the meaning of 'wating in line'. The longest of lines at the grocery store can't compare to what the people of Haiti are facing." Haven't really had time to think about resolutions for 2010. (I'm the mother of twins...what can I say?!) But, I know now that one thing I want to change is my perspective. I not an "out loud" griper.....the whiny sort that complains about every little thing. But, if I'm honest, I have to admit, I have my days and moments when I think to myself "Do I really have to do another load of laundry?" "Dishes...UGH!!!" "I can't think of anything to make for dinner!" and "Why are these pictures taking so long to upload?" and "Why oh why does this person in front of me not know how to drive?" ..and on and on it goes. Am I the only "closet complainer" out there? Not big things....ya know, just the small everyday things that can get on your nerves. I'm forgetting all the while that the pile of laundry is there because I've been blessed TWO adorable little boys. And a sink full dishes means my family has been well fed when others in the world are starving...literally. And while I'm fretting over what to make for dinner...many people in world have no choice whatsoever...they eat whatever the humanitarian relief worker hands them to eat. And my pictures taking forever to upload means I've been blessed with many, many happy moments that I want to remember when millions are trying to forget the hell they are living through. And if I would just take a minute to think about it, I'd see that if I'm really that tired of dealing with crazy drivers, I could always do the alternative...sit at a bus stop in 30 degree temps and wait for a bus to come take me where I need to go. I don't mean to be all somber.....and I hope this post isn't turning too melancholy. I just want to be more mindful, that's all. And a little more intentional about taking my thoughts captive and remembering how blessed I really am. I'm praying for the Haitian people and I'm thanking them for showing the world what gratitude really looks like. Ok, I'll start with what you really want to hear.....the answer to the question: How are Luke's seizures? Short answer: A LOT better!! Before I go any further, I have to tell you we are, ELATED and very, very grateful. Luke's neurologist told us today (and by the way, Dr. T is the smartest of the smart....world-renowned in pediatric neurology), "well, we don't really know how this diet even works...why or how it controls seizures." :) Smart people get uncomfortable when they can't explain things. It's cute. Of the past 15 days, 12 have been seizure-free!!! "Normal" for Luke was about 2 clusters a day. (Infantile Spasms come in "clusters"...one seizure after another, 3-10 seconds apart). Each cluster consisted of 30-40 seizures. You do the math and that's 60 seizures a day, up to 2,000 seizures a month. YIKES. In the last 15 days, he's had 3...that's right THREE clusters total. That means we've seen about a 90% reduction in the last two weeks. Luke has officially been on the Ketogenic Diet for a month now. We've made some adjustments, changed formulas, tweaked something here and another something there...... This will continue. After all, when it comes to seizures, 90% is fantastic, but 100% seizure control is the ultimate goal. Even one seizure every now and then can wreak havoc on a 1 yr. old's brain so we're working to get them gone....ALL gone. We are increasing both his daily caloric intake and his total fat intake. **The doctors didn't order an EEG yesterday. Since Luke is still having some seizures, the thought is that probably things won't look much differently in his brain right now. Once we have a long period of time without any seizures, we can call St. Louis Children's and arrange for an EEG to be done. THAT TEST WILL TELL THE REAL RESULTS. The reality of Infantile Spasms and really seizures in general is that sometimes you see them and well, sometimes you don't. And by not seeing them, I mean simply they are happening in the brain without any demonstrative display on the outside. So, while we aren't seeing the big clusters of startle jerks, it doesn't mean Luke isn't still seizing. (I know, bummer, right?) So, we wait......and hopefully we can get an EEG within the next 2 or 3 months and know for sure what is going on in his brain. **The doctor and dietician were very celebratory with us yesterday. Any improvement is a reason to celebrate. That said, they wanted to make sure we keep our feet on the ground. There are cases when the Ketogenic Diet works wonders and then......it just stops working. Like I said before, there's a lot of tweaking that can be done and we can attempt to get it working again, but it's not always possible. Some children will end up having to try anti-convulsant drugs again. **So, if we get these seizures gone once and for all, Luke will start developing normally right? Eh, I wish. Dr. Neuro explained to us yesterday that we really don't know what is causing Luke's developmental delay. Is is the seizures or is it the brain injury? We can't forget that at birth Luke suffered a massive brain bleed, on both sides of his brain. Nothing short of a supernatural miracle can heal the brain from that kind of injury. Again, we have to wait and see (there's so much waiting in life, isn't there?). Our deepest desire is that we'll begin to see Luke start developing more and more. **Luke has lost a significant amount of weight. This is somewhat normal for Keto kids, however he has lost even more than normal. So, we've increased his daily caloric intake to 1,050 cal per day. His sweet baby rolls are gone. When it comes to seizures, you find yourself living to the tune of "What is the lesser of two evils here?" And, well, seizures are almost always, by far, the greater evil. **Luke underwent a series of genetic testing back in October, in an effort to find a cause for the epilepsy. The results have all come back normal (which we expected since his identical twin shows no signs of this disease). So, we're back to what we suspected all along....the epilepsy is a result of the brain bleed at birth and other abnormalities in his brain as a result of that injury. **Luke will soon start more (LOTS more) therapy. It's time now to bump up our efforts and get him moving, exercising, and working to gain strength, endurance and mobility. 1) Pray that we see continued success on the Ketogenic Diet and that 100% seizure freedom comes quickly!! 2)Pray for healing and complete restoration in Luke's injured brain. 5) A recent MRI showed Luke still has A LOT of fluid on his brain (I'll blog more about his later). Keep praying this fluid drains. The doctor doesn't feel a shunt is needed at this time, but it's still definitely a possibility if the fluid level increases. 6) Pray for Luke's vision. We still don't think Luke can see a whole lot of anything. His eyes are perfectly healthy....the connection between his eyes and his brain is not. This can sometimes improve with age. Pray it improves! 7) Pray for Luke as he starts more therapy. It's a lot of work for a little guy and he tires easily. Pray we get in touch with GREAT therapists (I'll be calling next week to set all of this up!) and that Luke begins to soar developmentally! !